New Delhi: Sir Ganga Ram Hospital, New Delhi on Thursday became the first 700-bed high capacity multi-speciality hospital from the national capital to join the Centre’s Ayushman Bharat – Pradhan Mantri Jan Arogya Yojana (AB-PMJAY). 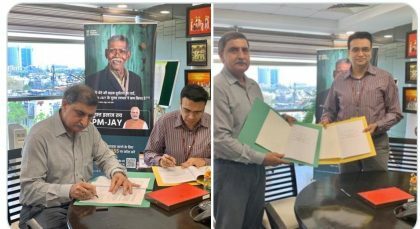 The hospital signed a pact with the National Health Authority (NHA) under the Union Health Ministry for empanelment in the Ayushman Bharat scheme. The agreement was signed by NHA CEO Dr Indu Bhushan and additional director (medical) of the hospital Dr Satendra Katoch here. “Sir Ganga Ram Hospital has become the first 700-bed high capacity multi-speciality tertiary care hospital from Delhi to join Ayushman Bharat, Many more will follow soon,” Bhushan said. According to Dr D S Rana, Chairman (BOM), Sir Ganga Ram Hospital, “We deeply value the ethos of Ayushman Bharat Prime Minister Jan Arogya Yojna. Our hospital will contribute towards the vision of the Prime Minister to provide health for all Indians. Sir Gangaram Hospital was founded in 1921 at Lahore by Sir Ganga Ram (1851-1927), a civil engineer and leading philanthropist of his times. After the partition in 1947, the present hospital was established in New Delhi on a plot of land approximately11 acres. The foundation was laid in April 1951 by the then Prime Minister of India Shri Jawahar Lal Nehru and inaugurated by him on 13 April 1954. In the past 6 decades, the hospital has now grown to the 700+ bed super-speciality tertiary setup that it is now.